Preparations underway for FeltUnited @ Clasheen! The base is sorted and I'm putting aside wool and various embellishments to adorn our collaborative wall hanging next Saturday for FeltUnited Day 2014! We'll be laying out our design on what remains of a large roll of rug base I bought from Mehmet Girgiç quite a number of years ago. Mehmet is a marvellous felter and teacher, do visit him and Teresa May O'Brien in Turkey for a workshop if ever you get the opportunity, alternatively take or organise a class with him in your own studio. Here's a close up of the first rug I ever made using this base, felted with Mehmet at Wollknoll in Germany and still one of my favourite pieces! Thanks a million to those of you who've confirmed you'll be here at Clasheen (George, Ruth, Anita, Karen and Samantha), if you've indicated via Smore or FB that you're coming but NOT emailed or spoken to me personally please just do so sometime this week. The reason that I'm asking you to drop me a quick line is that SO many friends worldwide have said they're coming and obviously won't all be able to make it, I'd like to have a guideline of numbers so that I can make sure I've enough drinks and food organised!!! The plan was to have a pot luck supper after the wall hanging was finished but maybe it'll work out best if we start the food from mid afternoon onwards, we'll play it by ear. Finally for today, please don't forget that you are encouraged to bring along any stash items you'd like to swap, sell or give away, this will all add to the fun atmosphere on the day! For example, I'm going to have items like plenty of excess bubble wrap and laminate floor underlay to give away (cut pieces perfect for smaller projects and brilliant if you teach) and black velvet necklace stands, large plastic rolling mats, hanging storage, packs of 10 Jiffy bags, large wire baskets, pool noodles and tonnes more items to sell at knock down prices. Alan always says that I buy storage solutions to store my storage solutions, he may be correct unfortunately!!! This entry was posted in Casheen, Felt, FeltU, FeltUnited and tagged Clasheen, collaborative felt wall hanging, Felt, felt wall hanging, FeltUnited by Nicola. Bookmark the permalink. Wish I were close enough to take part. I wish you were too Dianne, there’s still time if you rush!!! 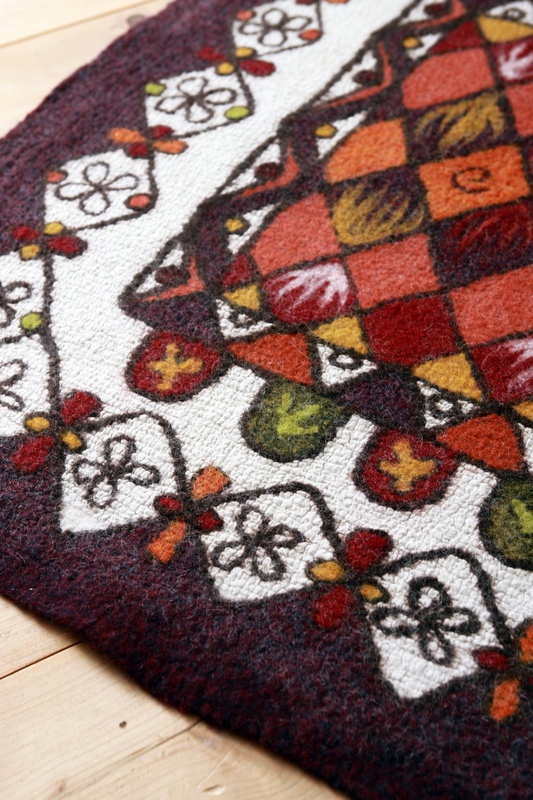 The rug is amazing – looks as if it’s woven! Have fun on Saturday – I’ll be thinking of you all when I’m at Lambeth Open (and doing some felting! ).